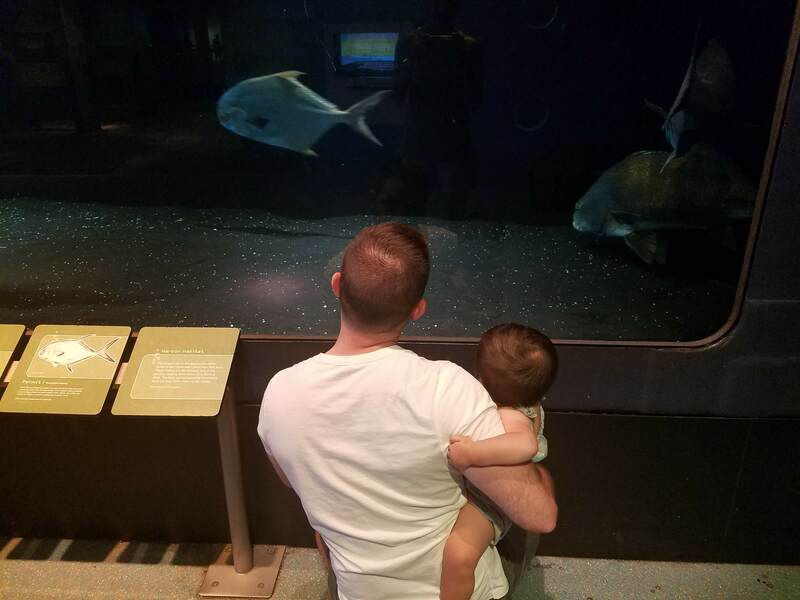 This past Saturday we were invited to join Momtrends at Liberty Science Center in Jersey City for a family fun-filled day of exploring the wonders of science. I’m actually already a member – it’s super close to downtown Jersey City via light rail, and I really enjoy the space – but I couldn’t turn down the opportunity to have private access to a few exhibits before they opened to the public for the day. 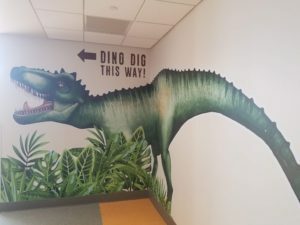 Namely, THE DINO DIG!!! I’m not as big into dinosaurs as I was once upon a time (though we did dress as a family of dinosaurs for our first family Halloween last October! ), but this is such a cool exhibit I can’t imagine anyone not being interested – and we were given access to it an hour before it opened to the public (I imagine it can get quite crowded!). The exhibit is the only one that requires you to go outside of the building, so be aware if it’s a sunny day as this was, you may want to put sunscreen on your little ones. You know they get excited and distracted and will forget to do it themselves. 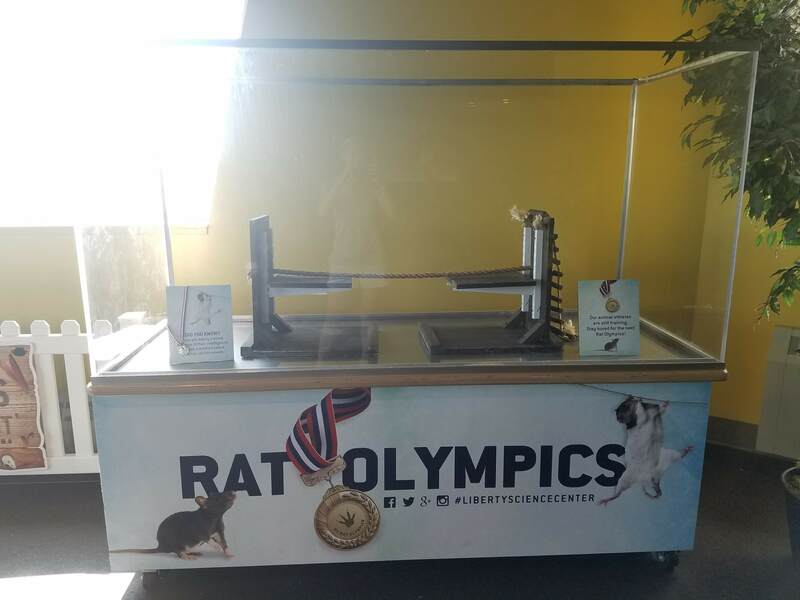 But what exactly is this exhibit? When you go out the doors, an LSC employee is there to greet you, give you what looks like a paintbrush, and explain how exactly to clear sand GENTLY away from the fossils you’ll uncover. 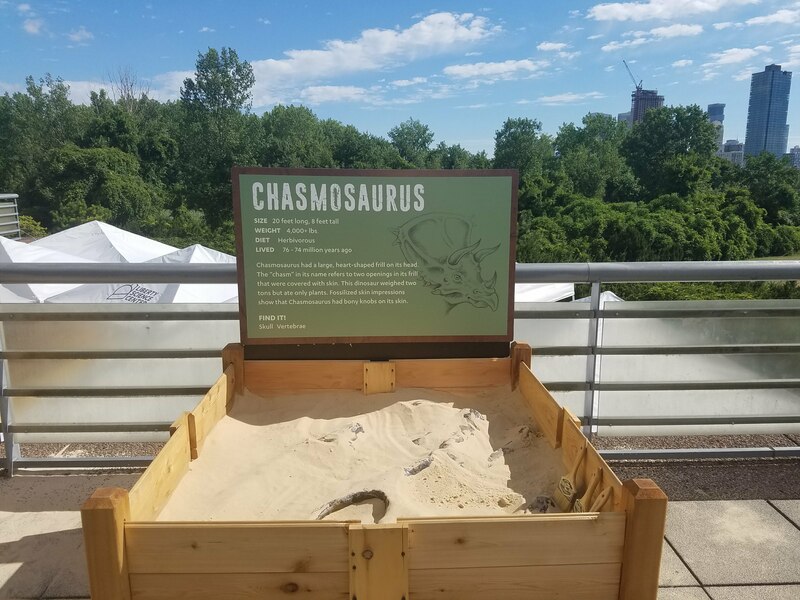 Then you can either stay on that landing (as in the pic above) and brush sand away from… chasmosaurus fossils in boxes elevated off the ground (we had to hold A as the boxes were too high for her to see if she were standing on her own). Alternatively, you could go down a short flight of stairs into what appeared to be a giant sandbox. 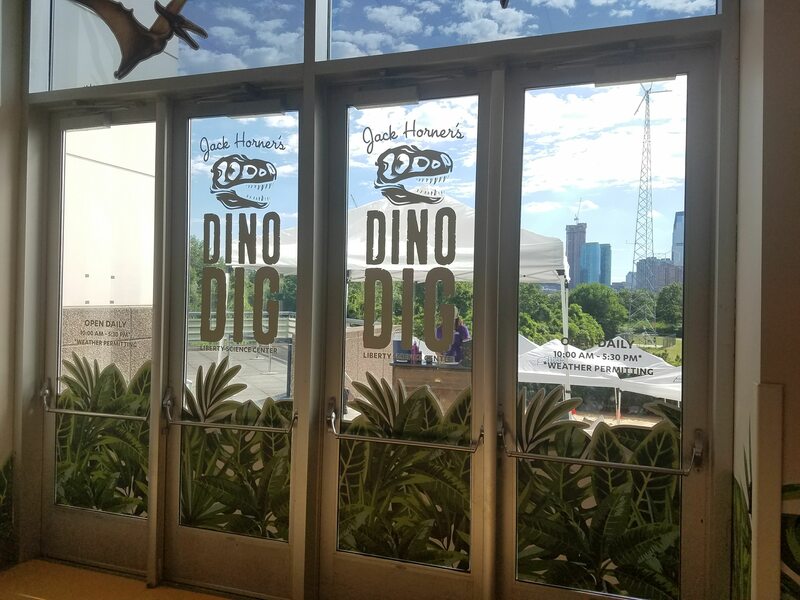 Don’t worry – you can park your stroller on that landing and there is always an employee there so you shouldn’t worry about your belongings (there is plenty of stroller parking all over the facility next to each exhibit entrance). 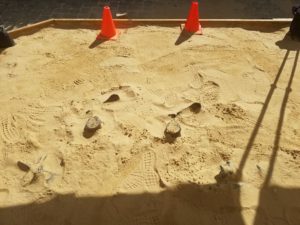 What’s in the sandbox, you ask?! 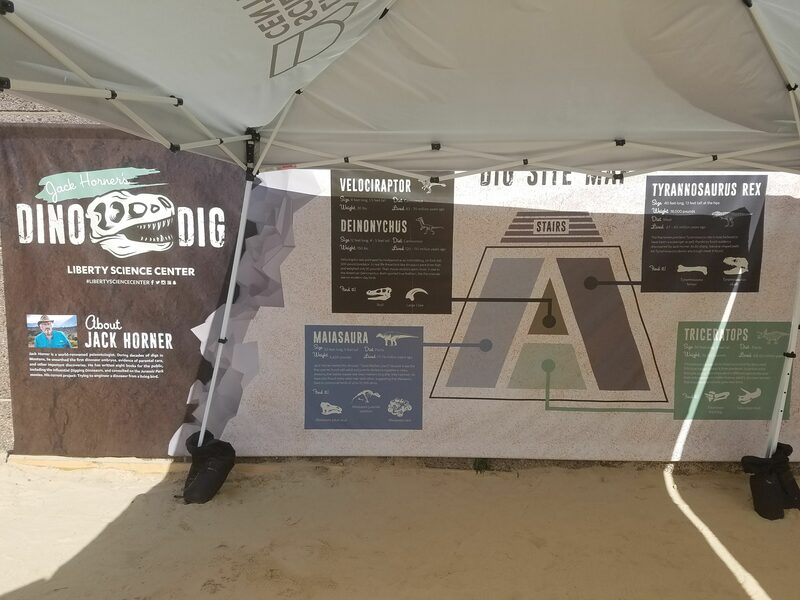 More LSC employees to answer any questions you have and… signs explaining facts about fossils and dino digs and… you could pick a spot and just start brushing away (I took this pic too early; he soon uncovered a velociraptor and I MEAN THE ENTIRE THING NOT JUST A BONE FRAGMENT). 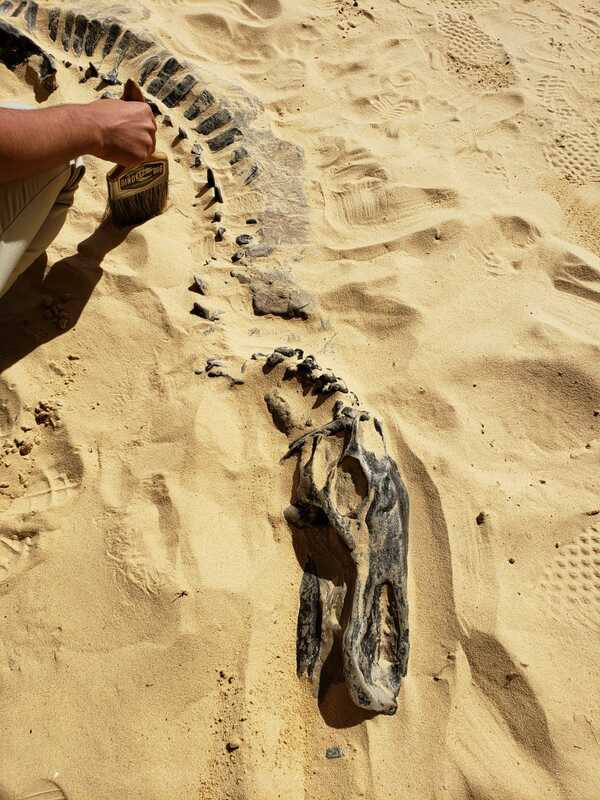 LOOK AT THIS COOL THING HE UNCOVERED LATER. I can’t even express to you how amazing this and how much fun for dinosaur lovers this must be. 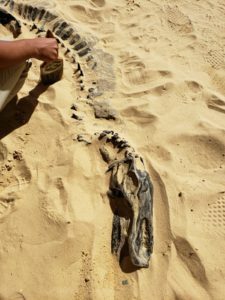 Hands-on experiencing brushing sand away and “discovering” fossils!! The LSC employees were happy to answer questions, and a few I heard while we were digging included “have any dinosaur fossils been found in NJ?” (yes) and “how tall was a velociraptor?” (not as tall as Jurassic Park would have you believe; only about as tall as a turkey but over 20 feet long!) More bones waiting to be uncovered. I walked by the entrance to the Jennifer Chalsty Planetarium, which opened at the end of last year. We weren’t able to catch a show (not for lack of invitation and welcome! but I would be hard-pressed to attempt to force an 11 month old to sit through something like this). 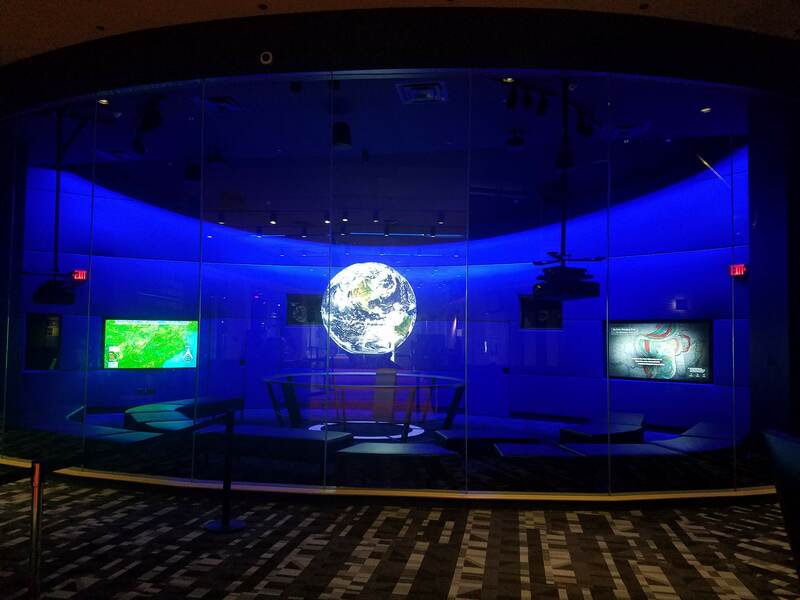 The planetarium is the 4th largest in the world and the largest in the world outside of Asia (the top 3 are in Japan and China). I’m super excited to go one day, but will patiently wait until A is old enough to enjoy! We continued onwards to another exhibit designed with the littles in mind. 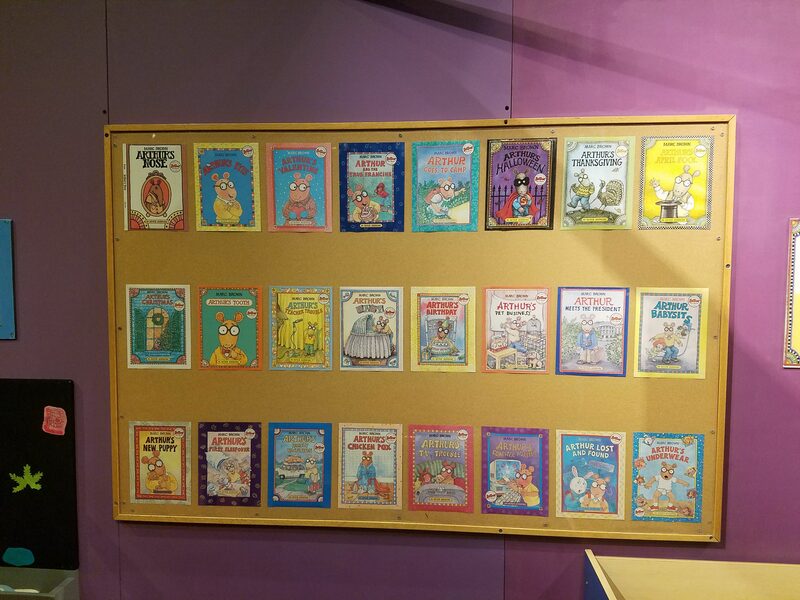 Arthur’s World! I read a lot and watched a bit of Arthur as a kid, though I don’t remember much of it. I’ve a sneaking suspicion that soon enough I will once again be familiar with it… I loved the set design — they had familiar scenes from around Elwood for fans of the books and TV show. They even had a green screen so you could “star” in your own bit of the show! 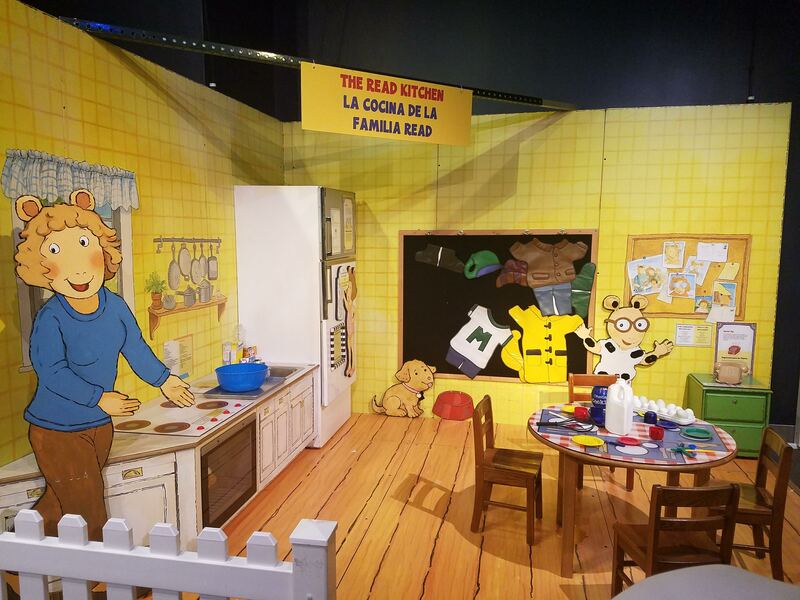 I definitely did not go in there and dance goofily to get my tired infant to crack a smile… There was a wall with covers of Arthur over the years, and to the left a felt storyboard for you to make your own stories. 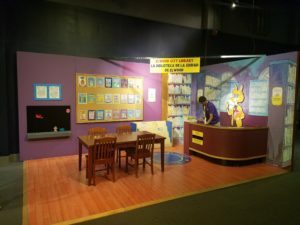 A fun exhibit in a section of the LSC that rotates through various children’s exhibits. The first time I visited it was Teenage Mutant Ninja Turtle focused, which was nostalgic for my husband and I. Next we went around to look at the various live creatures that live at LSC. My husband is quite an animal lover, and A has picked this up from him (I’m pickier about what animals I love, so I hesitate to say I am an animal lover, haha). 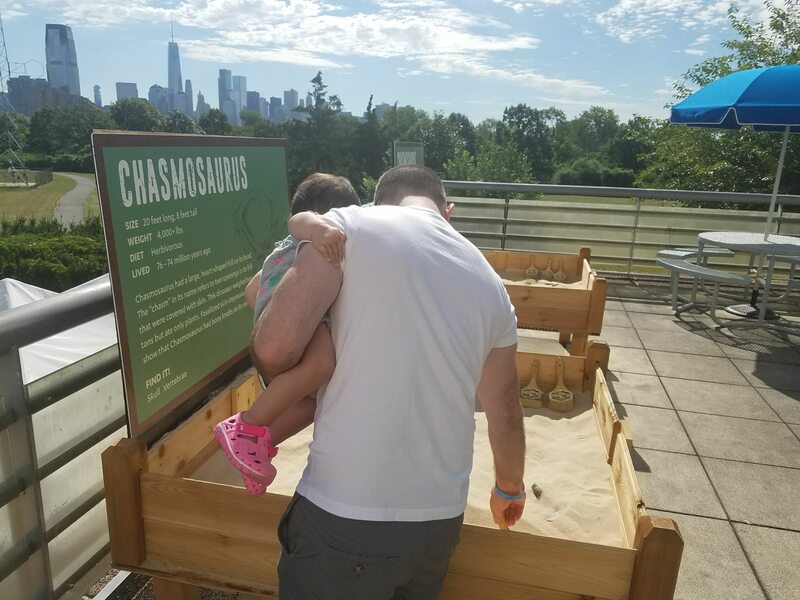 She really enjoyed him showing her all the various animals, reading the signs to her and explaining them, making animal noises. 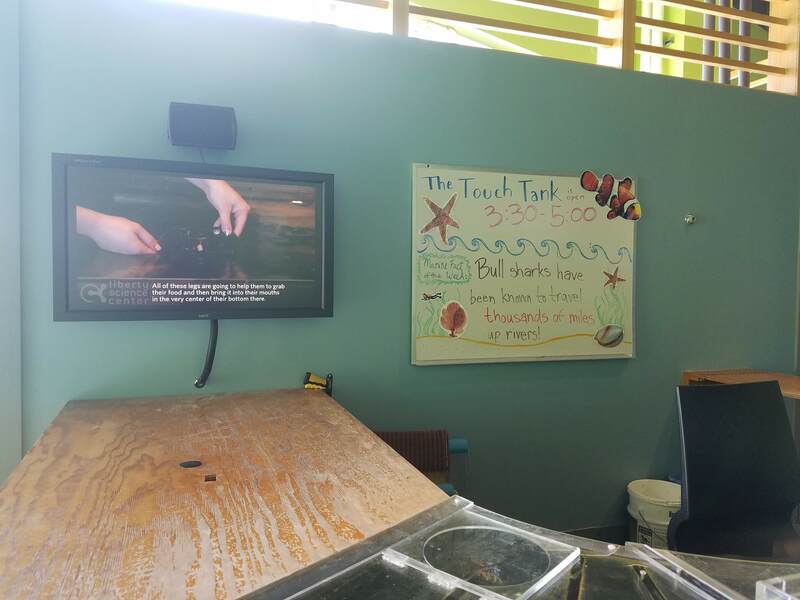 There is also a Touch Tank but that wasn’t open until later in the day. We went up for an “Animal Experience” according to the schedule but sadly it’d been canceled for the day. Instead there was a woman just showing a Madagascar Hissing Cockroach (there’s a whole tank of them in that section). She offered to let us pet her (the cockroach, not the employee), which Hubby accepted. I declined and made sure he used anti-bac on his hands afterwards. Another special exhibit right now is Grossology, the biology of the human body – the icky parts. Mucus, poop, etc. We walked through very briefly because A had fallen asleep at this point, after fighting her nap for hours (she was so excited by everything around us!). It was a bit noisy as exhibits tend to be, so we breezed through which is a shame because it was another super interactive exhibit with stuff to crawl/climb through, buttons to press, animatronics to talk to you about science facts, and tons of fun bits – including a giant nose that “sneezed” on me as I innocently walked by, causing me to scream loudly while my husband zoomed away from me, shooting me a “what is wrong with you, the baby is sleeping!” look. Oops. (She didn’t wake up at least.) I really want to go back and examine it more in-depth with A! 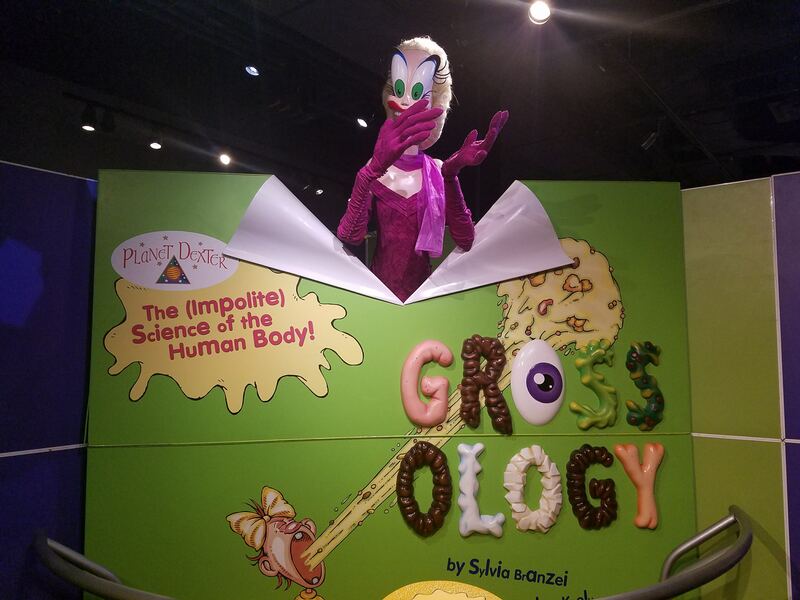 There was even a slide that took you “through” the esophagus into the stomach. 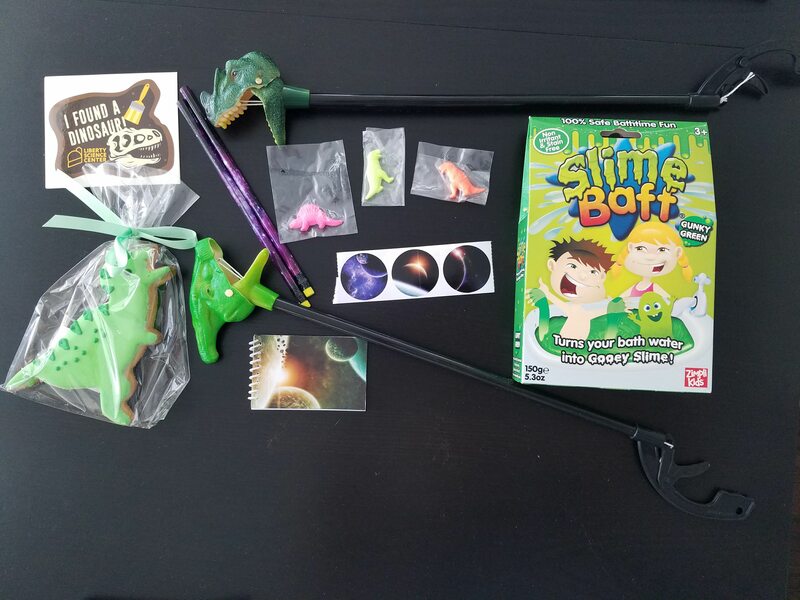 We also got a fun swag bag filled with goodies that you can get at the gift shop. I’ll probably not be giving my child a “slime baff” anytime soon, but you know… I did have fun “biting” her finger with that T-rex grabber!! 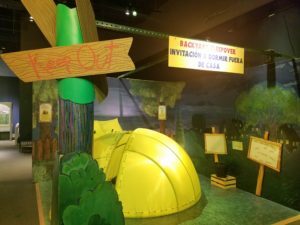 A bit more information: there’s also a permanent exhibit called “I Explore” for visitors under 5 years old, designed for those with younger children with them. I haven’t yet made it into this exhibit as it is always crowded and I’m always drawn more to the living creatures and other exhibits, but I will make it back! 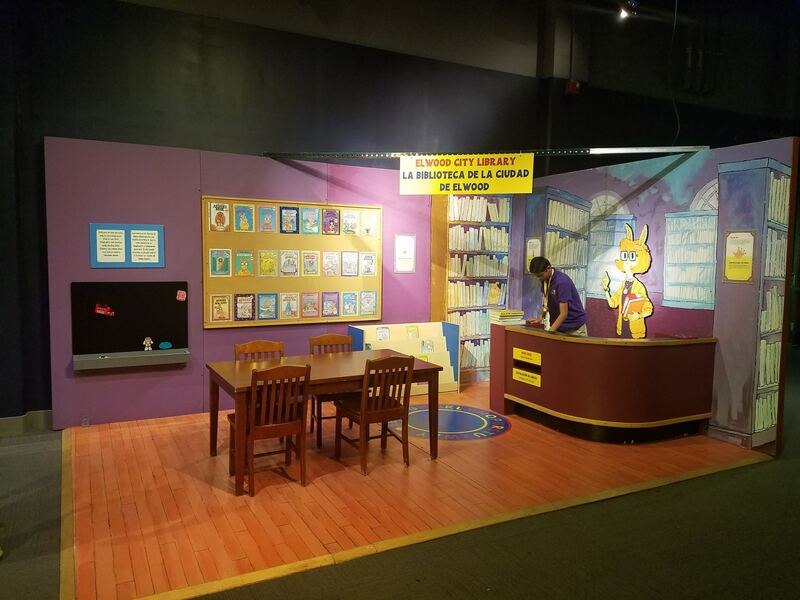 I believe it is an even more interactive space than the others and has a lot of LSC employees on hand to help the little learners explore. There is stroller parking in abundance all around the facility, and two large elevators that service every floor. On busy days, it might take you a while to get an elevator to where you’re going, but that is the case anytime you rely on elevators. There are bathrooms on every single floor, and I believe most if not all of them have changing tables. This is important when you just can’t wait for an elevator and your little one is doing the pee dance! (Okay, my little is in a diaper still, but I’m sure this is important. I mean sometimes I need the facilities too!) There is also a nursing room on the 2nd floor; be sure to flag an employee down (I believe at the entrance to “I Explore”) to use the key to unlock it. It is comfortable enough for nursing in private and will fit your stroller easily, and if you are so inclined, I think it has two chairs so you could share the space with another nursing mama. I’ve only used it once. I’m pretty sure they would not object to you nursing elsewhere on the premises, but it is nice to have a private space for those of us who are more comfortable in a padded chair, or have easily distracted little ones, etc. I can’t emphasize enough how much fun I think the Liberty Science Center is for the little ones (and the adults who go with them, because let’s be honest – some children-geared activities are painfully boring for us and this is NOT one of those!). 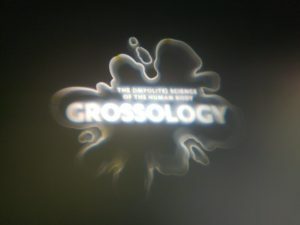 It definitely stirs the curiosity in the world around us, and breaks it down into fun, bite-sized bits of information that are more easily digested and retained. 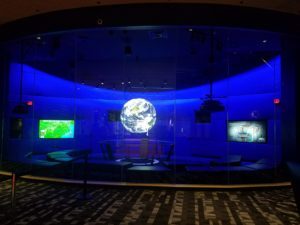 All of the interactivity really made me wish I’d spent more time at the NY Hall of Science (I grew up a 20 minute walk from it and have never visited), if it’s at all anything like LSC! Perhaps I would have grown up with more interest in STEM and gone into a different field. By the way — admission for those under 2 years old is free!! I have a membership for just me which takes care of my admission and she’s free when I go. Membership means that I can skip the long ticket lines, too. Just saying! 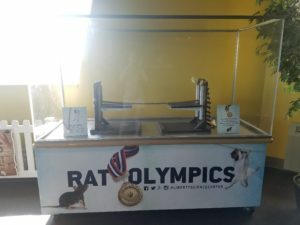 Contest ends 7/29/2018 at 11:59 EST. I will reach out to winners on 7/30/2018. Not open to family members or employees of The Feisty Foodie, the standard terms and conditions apply. Winner will be chosen by random drawing. Thanks for entering and good luck! 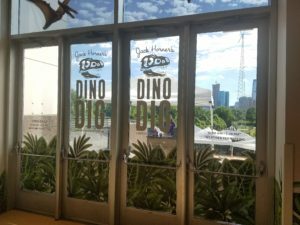 Hands down the Dino Dig!!! My son could spend hours there! Dino DIG!!!!! Mostly coz my son, or rather husband, loves dinosaurs! Congratulations Mabel! The random number generator picked comment #5 to win, and that’s you — please keep an eye out for an email from me. Thanks everyone for entering!! Definitely the Dino Dig! 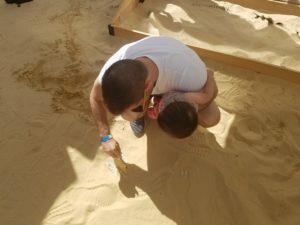 My little one loves to dig up random stones and pebbles from the sand pit… So this sure will surely love! 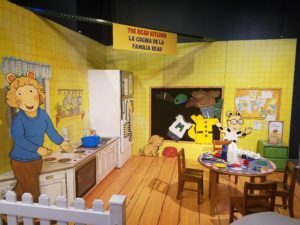 Arthur exhibit! My daughter has been asking to go all summer but since our membership expired, I’m too cheap. 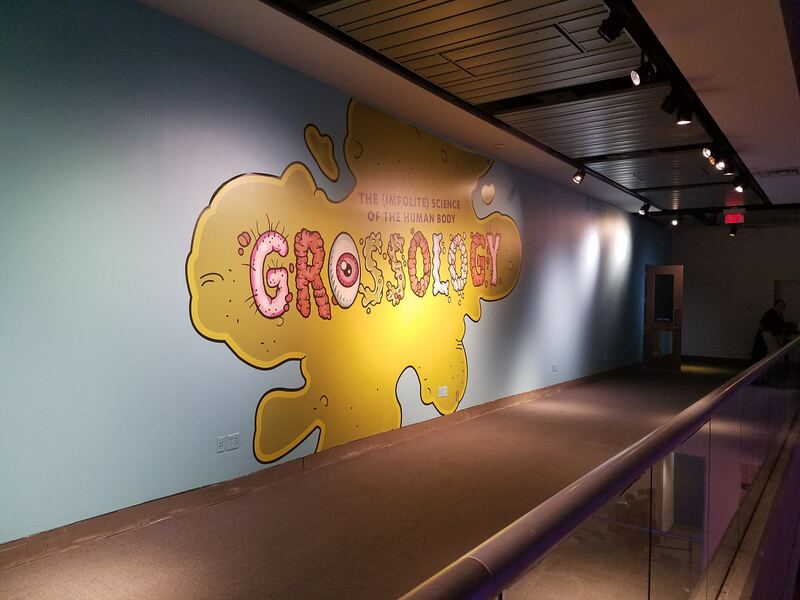 I keep seeing signs for the Grossology exhibit and it looks interesting!! Duh! 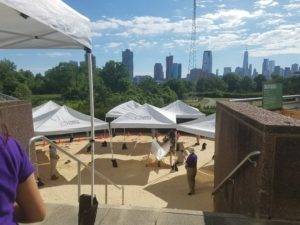 Dino Dig! Your pictures were such a great marketing for it!!! The Davises want to go asap now. 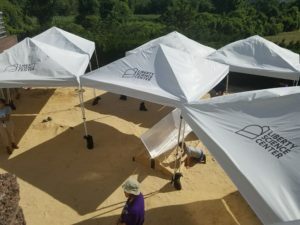 I think Derek is going to be excited about the Dino Dig ! 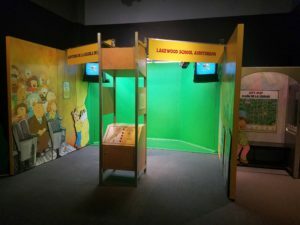 What a cool exhibit! My girls are excited about the Dino Dig!! !